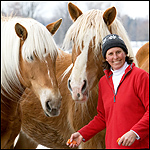 Christina Handley lives on a working farm in Ontario with her husband Boyd, their three Belgian horses and their dog, Dingo. Handley is a full time freelance photographer with a career spanning over 12 years. 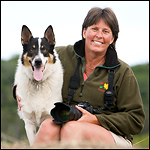 She started her professional photography career in 1997 and has since had her work featured in various catalogs and magazines, including Horse Illustrated, as well as calendars and product advertisements. Christina has also always loved horses, and combining her two passions was a natural occurence. The freedom to be creative is what she enjoys most about being an equine photographer. Spending time outside and taking photos of horses allows Christina to use her favorite techniques for capturing the best images: natural lighting and selective focus.